Beautiful photo – looks like an exquisite mix of photograph and drawing. I can imagine your delight at a breath of air through those fine tendrils to cut that heat. So glad you like the photo, Olga, a scan actually. I do wish the feather was as big as a fan, but it is only about the height of the palm of my hand. I found it on our deck when we were having our evening meal out there. That fine fluff is delightful. I wonder what bird it is from? 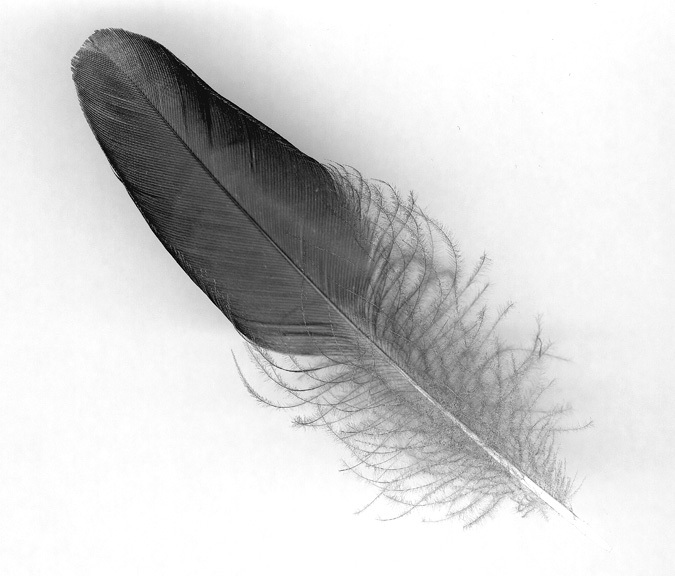 It is a truly elegant feather. As far as what kind of bird may have dropped it, I feel fairly safe in saying it probably wasn’t a peacock. I hope the weather stays perfect for the wedding. Susan, I’ve never had a peacock feather, wouldn’t that be something. The weather is back to very hot and sunny at 31C today, and the same is forecast for tomorrow, the wedding day. What an elegant photo. We’re coming to Seattle next wk and will probably visit Vancouver. I’ll be in touch. Thanks, Hattie, and look forward to hearing from you next week. It’s hot in Seattle -100F yesterday. I hope the wedding place has air conditioning for it’s hot again today. Off topic and less pleasant, but what do you think of this, read in Prufrock News? Marly, apologies for my late reply! I’m still in lazy summer mode and have had house guests. Interesting and thought provoking article (the link took me to Harper’s Magazine). I think it is overly alarmist in tone though I do agree this Dugin sounds quite scary, I hadn’t heard of him before. Did you read some of the comments? I know of Sofi Oksanen and have read a couple of her works. Her mother is Estonian and her father Finnish so she is well aware of the difficult Russian Communist period in Estonia, which she wrote about in her novel Purge. Finland was very fortunate not to have been ovetaken as another Communist country partly thanks to the help of the Germans during WWII. Finland had a very tough time for some years after. It was likely a factor in my father’s decision to bring his family to Canada in 1951. The Finnish governments have been accused at different times of “Finlandization” yet it seems to me that working with respect with the neighbours has been successful for Finland who has had a good business relationship with Russia. It is certainly feeling the negative financial impact of the sanctions since the Ukraine situation. I think sometimes the Western powers have an overly aggressive attitude to Russia as if it was still a Communist nation. Diplomacy and respect can go a long way, as we have seen in Finland, even as they are nervous about Russian aggression this year. A lot of the comments suggest that the article is inaccurate, and that Bäckman should not have been included… But it’s nice to hear an opinion from someone you know… And yes, one always hopes that diplomacy and respect can find a way. I don’t known Oksanen. Have you been interested in her books? I think the only Finnish author I’ve read in the past, say, five years is Leena Krohn. Marly, I forgot to say anything about Bäckman though he is not worthy of discussion, imho. You must read Oksanen’s Purge, you can find it at major online booksellers and it is not expensive. I got that English one because I would have to order the Finnish one directly from Finland and then would have been dinged with duties, as happened some years ago when I ordered two Finnish rock art books. You may be interested in reading about her in wikipedia and at this is Finland. I think my other readings must have been online.